Crew of the LÉ Róisín as they launch to rescue people from the Mediterranean Sea. THE GOVERNMENT HAS agreed to increase pay for members of the Irish Army who’ve served in the Mediterranean. 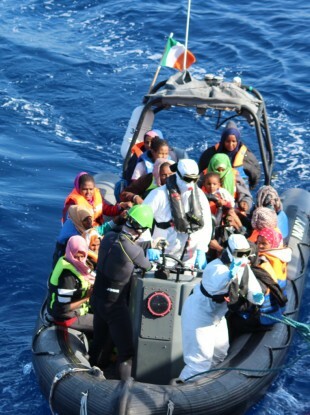 Since May 2015, the Irish government has deployed six naval vessels to help Italian authorities rescue thousands of migrants looking to cross the Mediterranean Sea to Europe. Today, the Minister with Responsibility for Defence Paul Kehoe confirmed that an agreement has been reached, and sanction secured, for an additional payment of €15 per day to those who served on in Operation Pontus. PDFORRA, an association representing soldiers, sailors and aircrew of the Defence Forces said that some soldiers weren’t able to afford fuel for 5 days a week, so some take a day’s leave to save them petrol for the trip. “I have been eager for a conclusion to this matter for some time,” Minister Kehoe said, acknowledging those previously raised concerns about pay. I am pleased that following the request of the Arbitrator, that PDFORRA and my department have worked together to successfully resolve this matter for the benefit of Defence Force personnel. The Minister concluded by confirming that the relevant payments to those Naval Service soldiers will be made in the coming weeks. Email “Irish soldiers who served in the Mediterranean to receive extra €15 a day”. Feedback on “Irish soldiers who served in the Mediterranean to receive extra €15 a day”.